The July issue of Kadokawa Shoten's Monthly Gundam Ace magazine is announcing on Thursday that Kadokawa's new manga magazine will feature five manga with anime tie-ins. 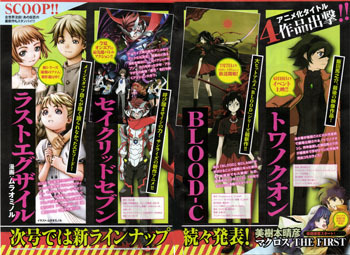 Four are from franchises with upcoming anime: Gonzo's Last Exile: Ginyoku no Fam television series, Sunrise's Sacred Seven television series, Production I.G's Blood-C television series, and Bones' Towa no Quon film series. Minoru Murao, the anime character designer of the first Last Exile anime and the manga artist of Knights and World Destruction: Futari no Tenshi, will draw the new Last Exile manga. In addition, Macross the First , the manga re-imagining of the first Macross series and Macross: Do You Remember Love? film by character designer Haruhiko Mikimoto, will run in the new magazine. Mikimoto has been drawing the manga in Kadokawa's Macross Ace magazine since its inaugural issue in 2009. Kadokawa revealed its plans for a new magazine last month, but it has not yet announced magazine's title. More announcement about the new magazine's lineup will appear in the August issue of Monthly Gundam Ace . More announcements about the new magazine's lineup will appear in the August issue of Monthly Gundam Ace next month.